1. 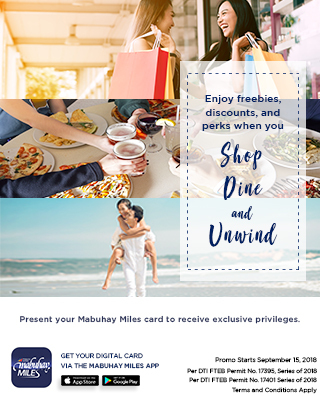 Customers must present their Mabuhay Miles membership card (Physical or Digital Version, Mabuhay Miles Travel Card, PNB Mabuhay Miles Credit Card), together with a valid ID to avail of the straight 10% discount on total bill. 3. Promotion is open to Mabuhay Miles Classic, Elite, Premier Elite and Million Miler members. 4. Discount can be availed from September 15, 2018 to March 14, 2019 only.